NMM 5879. 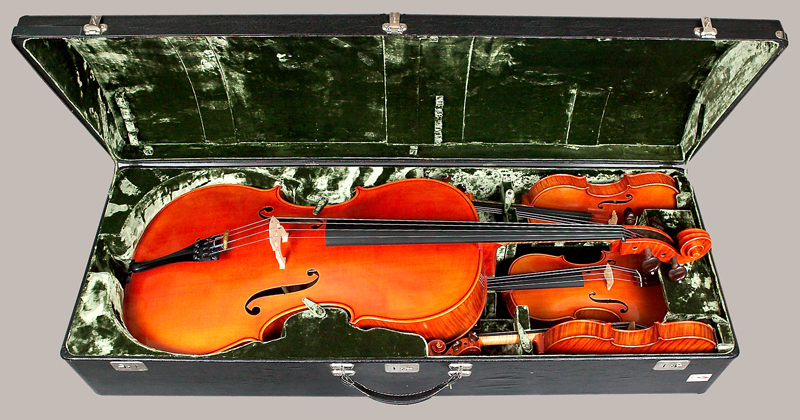 Violoncello by Kurt Lothar Meisel (1929-2011), Owatonna, Minnesota, 1977-1978. Guarneri model. Serial no. 1. 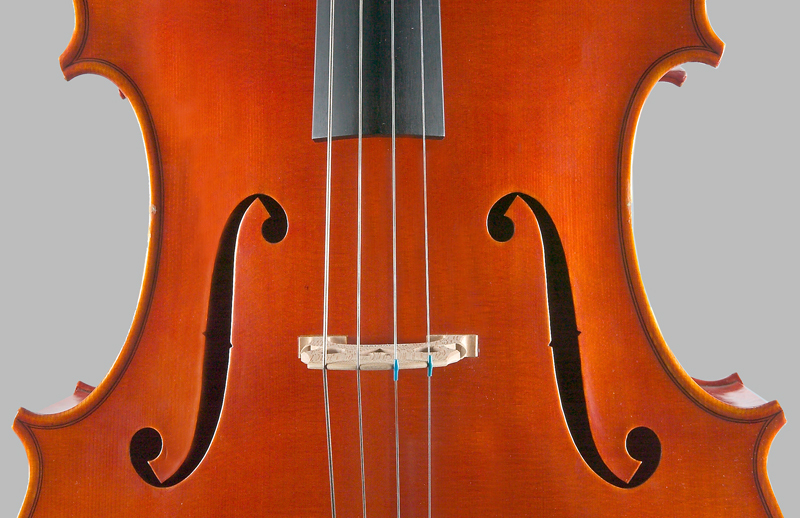 This instrument, the only cello ever made by Lothar Meisel, won a Certificate of Merit for Cello Workmanship from the Violin Society of America, La Jolla, California, 1978. Gift of Kurt Lothar and Patricia A. Meisel, Owatonna, 1995. 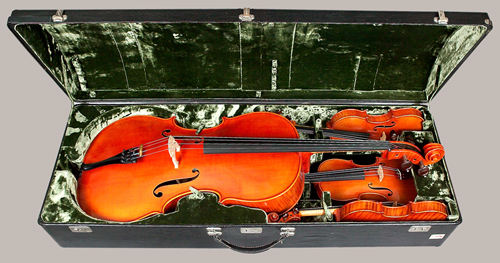 NMM 5879 is the cello in a quartet of instruments at the NMM made by Lothar Meisel (see also NMM 5876, 5877, and 5878). Printed in brown ink on paper label with lined texture and wavy-line border, the location, last two digits of year, and serial number written in black ink, signed "Lothar Meisel" in blue ballpoint pen over label text: [bird on branch] K. Lothar Meisel [KLM monogram over lyre] / Violinmaker and Repairer / from Klingenthal, Germany / OWATONNA 1978 No: 1 / MINNESOTA / MEISEL 1977-78. The bird on the label represents the family branch, known as the "Bird" Meisels. Branded on inside of back, visible through treble f-hole: K.L.MEISEL OWATONNA/MINN. Branded on inside of back in front of top block, to treble side of center joint: K.L.MEISEL OWATONNA/MINN. Branded on inside of back in front of bottom block, to bass side of center joint: K.L.MEISEL OWATONNA/MINN. Branded on inside of top in front of top block, to bass side of center joint: OWATONNA/MINN. Branded on inside of top in front of bottom block, to treble side of center joint: OWATONNA/MINN. Branded in inside of top between center joint and treble f-hole: OWATONNA/MINN. Top: two-piece, quarter-cut spruce: medium grain broadening to wide at the flanks. 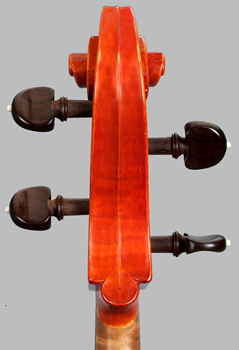 Back: two-piece, quarter-cut maple: medium curl descending from center joint; maple dowel through back into top block; two maple dowels through back into bottom block, one on each side of center joint, spaced 27 mm apart. Ribs: quarter-cut maple: prominent, irregular broad curl angled to right on bass side, angled to left on treble side; lower ribs divided by wide pernambuco strip; rib corners chamfered. Head and Neck: maple: prominent, broad curl; pegbox with shoulders; inside of pegbox stained black. Varnish: medium orange; wood texture visible through varnish, resulting in a matte effect. 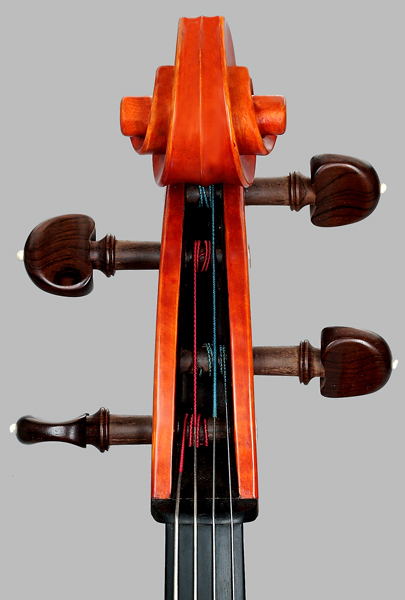 Fingerboard: ebony; subtly raised area along center, lower end; made by Josef Klier, Bubenreuth, originally from Schönbach. 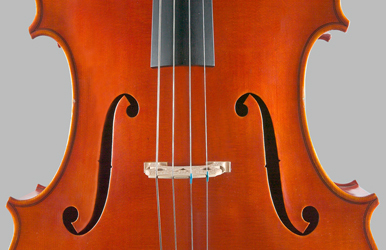 Tailpiece: black plastic with four built in black-painted steel fine tuners. Endpin: black plastic and nickel-plated steel; extendable. F-holes: steeply pointed wings; lower wings channeled; inside edges stained black. Other: spruce cleats along inside of top center joint in upper and lower bouts; maple cleats along inside of back center joint in upper and lower bouts; inside of body stained light brown. Lit. : André P. Larson, "A Salute to the Instrument Makers of the Vogtland, Including Nine Generations of the Meisel Family," The Shrine to Music Museum Newsletter 23, No. 1 (October 1995) p. 6. K. Lothar Meisel with Betty Vos, The Meisel Family Violin Makers: Klingenthal, Vogtland, Saxony (Ely, Minnesota: Singing River Publications, Inc., 2007), pp. 254-255.